A new mammography apprenticeship, the first of its kind in the country, has launched in London. 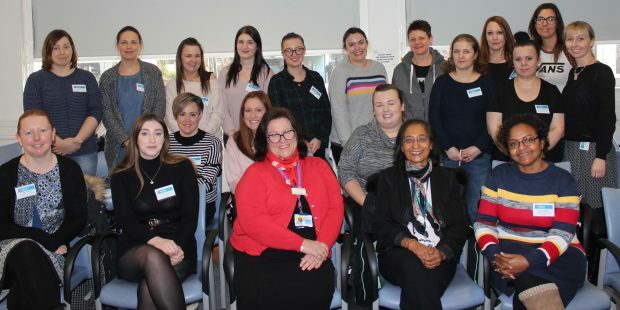 In January, the first 18 mammography associate practitioner apprentices attended an official launch of the new course being delivered at St George’s, one of the UK’s largest teaching hospitals, working in partnership with South Thames College. A shortage of breast screening mammographers was identified back in 2016. As a result, the NHS Breast Screening Programme worked with colleagues from national training centres, Health Education England (HEE), the Society and College of Radiographers (SCoR) and screening providers to set up a mammography trailblazer group to identify and develop a way to meet the staffing needs of breast screening centres across England. Claire Borrelli, Education and Training Manager at St George’s National Breast Education Centre, and Hansa Jadva-Patel, Deputy Education Manager at St George’s, were part of the trailblazer group. They helped write the apprenticeship standards and shape a programme to address this shortage and ensure the role would improve the efficiency and quality of care women receive. Mammography associates work within multi-disciplinary teams in the NHS, doing the mammogram X-ray tests in breast screening services. The apprentices will be trained to use specialised mammography equipment and produce mammography images of consistently high quality to meet rigorous national programme standards. On completion of the 12 to 18-month apprenticeship, the mammography associate practitioners will be qualified to do routine 2-view mammography. This is a great partnership and opportunity, delivering a joint apprenticeship programme, written by employers for employers. It will not only make a difference to individuals’ lives, enabling them to progress and enter into a meaningful and sustained career, but the training and skills they will gain will also save lives. I am delighted we are part of this amazing initiative and look forward to watching the first cohort succeed and achieve. After 18 months of planning and preparation, it was fantastic to finally meet our first cohort of apprentices. Each one had a real enthusiasm for the course, and I’m certain that mammography associate practitioner apprentices will become a highly valued addition to the workforce. St George’s is proud to be the home of this unique programme and we’re looking forward to seeing our apprentices develop over the coming year. Vanessa Matthews is one of the first cohort of new apprentices. It’s a real honour to be part of this pioneering cohort. Having now started the programme and met my fellow apprentices, it’s clear that we’re all committed to delivering the highest standard of care to patients at NHS breast screening centres across the country. For more information on the apprenticeship please see our previous blog article.